This is one piece that is a personal favorite and one I've wanted to showcase for the longest time. The only reason I haven't is because I have not found any good pictures of Kate with this item. Either the pictures are really bad or you can't really see the bag, as in the example below, which is the only picture I could find. The bag is part of the Mulberry Bayswater collection, and from what I can find out it is a limited edition "Cookie" version, so called because of the cookie-cutter style scalloped edging. The regular Bayswater collection is similar in style but plainer, without any scallop detail. The picture below is the Cookie version that Kate is shown with, in beige pebbled leather. The bag is quite rare and I found it impossible to find even an expired listing for this item! Mulberry Bayswater "Cookie" via The Bag Lady. 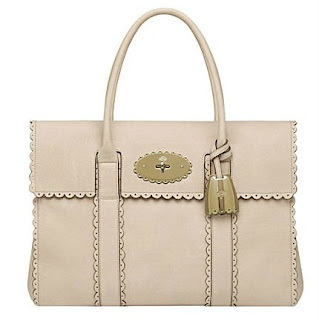 Other Mulberry plain Bayswater listings that I've seen are priced at around $1,500 for the regular style bag, and about $1,300 for the smaller Bayswater satchel style. They also come in a variety of textured leathers, such as snake, ostrich, or smooth, which also affects the price. The best repliKate I managed to find (other than outright "replicas" of course!) was this collection from ASOS. 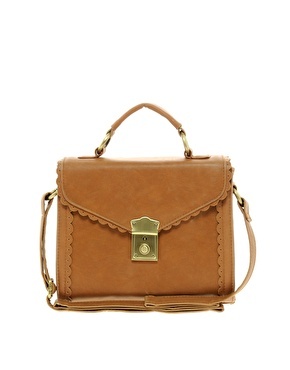 First up is this leather satchel available in tan or black. I'll admit that the style is not an exact match. But you have to admit that it is a very good Mulberry-inspiration piece with the scallop detail in particular being on par with the original. Another detail where it mimics the original is that it is actual leather. And while the Bayswater has a postman turn lock style closure, this one has push lock closures reminiscent of the Mulberry push-lock style, so it is still very much in the Mulberry look. This style is approximately $105.54 U.S., and as low as $84.43. It comes in tan and black. 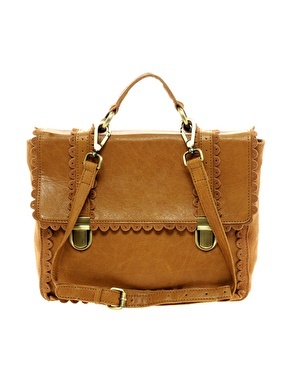 ASOS - leather scallop edge satchel in tan. 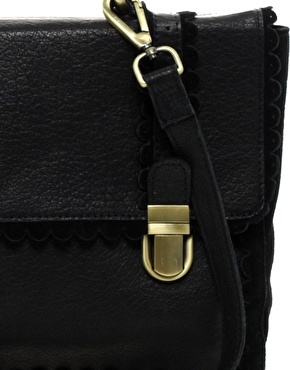 ASOS - leather scallop edge satchel in black. Another ASOS style that seems inspired by this Mulberry look is the scallop edge satchel below. It is boxier, hard framed, and synthetic leather. This bag is approximately $38.70 U.S.
ASOS - scallop edge satchel.